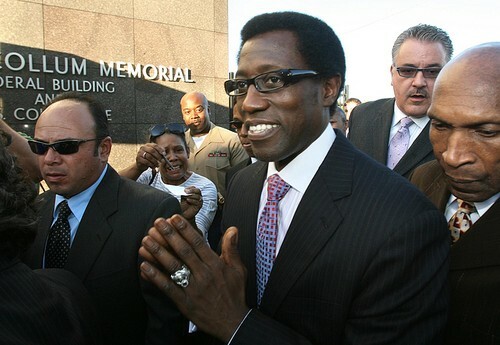 Actor Wesley Snipes was ordered this week to turn himself in to a federal prison in western Pennsylvania to serve his sentence for tax-related crimes, a court document made public Wednesday shows. The prison is a medium-security facility for men about 90 miles south of Buffalo, N.Y. It has a capacity of 784 prisoners, according to "The Federal Prison System" by Mary Bosworth, though it housed nearly 1,400 men in 2002. The federal Bureau of Prisons says it operates a prison camp as a satellite facility that houses minimum-security male offenders. Federal prosecutors in Central Florida argued Snipes obstructed the IRS and attempted to avoid paying millions of dollars in taxes. Snipes, 48, the Orlando-born star of the "Blade" trilogy, "White Men Can't Jump" and "Jungle Fever," was convicted in 2008 of three misdemeanor counts of willfully failing to file federal tax returns. Last month, a federal judge rejected Snipes' demand for a new trial and ordered the Jones High School graduate to surrender to federal authorities. The Marshals Service's letter to Snipes said failure to report to the prison on time may result in additional criminal charges. He was not in the custody of the Bureau of Prisons on Wednesday, according to the agency's website. Maureen McHale, Web Marketing Consultant, Longwood, FL HireMaureen.com. Simple theme. Powered by Blogger.